June 6, 2018 marked the 50th anniversary of the death of Robert “Bobby” Francis Kennedy. For the past few weeks I’ve been on a quest to learn about who Robert Kennedy was. What is his legacy? The best documented presidential deaths in the Political History collections are those associated with assassinations. In part 1 of this post, we examined some of the many objects in our collections connected to the death of Abraham Lincoln. In this post, we’ll be looking at objects tied to later presidential assassinations in U.S. history. The best documented presidential deaths in the Political History collections are those associated with assassinations. Though the nation has mourned when presidents died of natural causes (our collections include many mourning ribbons and broadsides commemorating this fact), those deaths did not produce quite the level of intimate, personal collecting as the unnatural ones. Tucked among the festive campaign mementos and first ladies’ gowns in the Division of Political History’s collections storage are a group of objects that people saved from somber moments: souvenirs of presidential deaths. For most of us, traditions are private and reserved for friends and family. But when you are the president expectations change, and everything, especially your funeral, becomes larger and more public. Last moments of famous people fascinate us. This is why compendiums of last words are so popular. It’s also why we have a handful of objects in our collection that are purported to be from the last moments of the lives of several presidents. You asked, we answered: Which presidents have visited the museum? Just in time for Halloween, your favorite collections managers from the Division of Political History bring you a new blog series: "Death in the Presidential Collections." Today's post discusses mourning clothing and jewelry worn by first ladies. The father of our country? Several decades after the American Revolution, George had come to be known to many of his countrymen as “pater patriae,” or “the father of his country.” No, not that George! I am speaking, instead, of George III, the king who had once held the loyalty of Britain’s North American colonists but who lost their allegiance when they chose independence in 1776. Read more about The father of our country? Wielding large portfolios under their arms, political history curators Larry Bird and Harry Rubenstein of the Smithsonian’s National Museum of American History will wind their way through the crowds at the GOP and Democratic National Conventions, not to find a better spot to see the podium, but to scout out the best political signs. Since the late 1980s, the duo have been attending political campaigns and collecting signs, buttons, posters, hats, sunglasses and other novelties that speak to the atmosphere of the conventions. 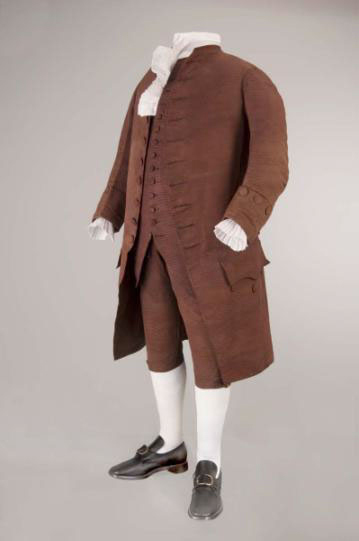 The Smithsonian’s National Museum of American History is adding Benjamin Franklin’s three-piece silk suit, worn on his diplomatic trip to France in 1778 that resulted in the signing of the Treaty of Alliance, to its permanent collection.